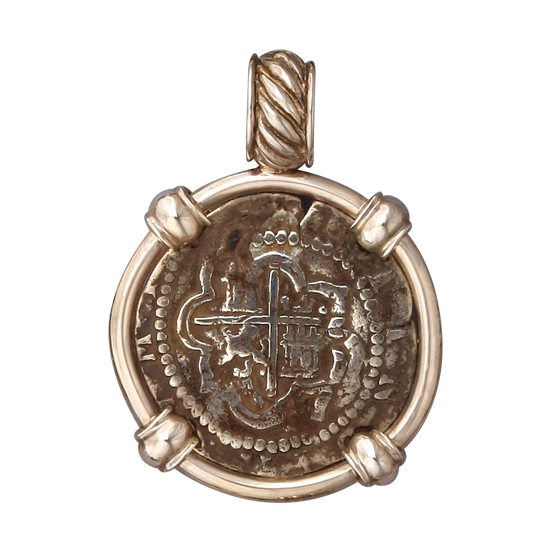 Spanish One Reale Cob Coin in Sterling Silver Pendant Mounting. OBVERSE: Crowned Hapsburg Shield (Coat of Arms) with Mint, Assayer and Denomination. REVERSE: Spanish Cross with Rampant Lions of the Leon Family and Castles of the Castille Family in the Quadrants, Enclosed in a Tressure or Ornate Brder, Legend Around. Circa 1577 - 1587. Mint: Potosi, Peru. Ruler: Philip II. ASSAYER: O.